Winn Park, a block-square park between P & Q, and 27th & 28th, seems dead to me. It doesn’t matter what time of day I see the park, it is almost always empty, sometimes with some homeless folks hanging out, and more rarely, a family with kids on the playground equipment. Other parks seem lively much of the day. Why are the parks so different? 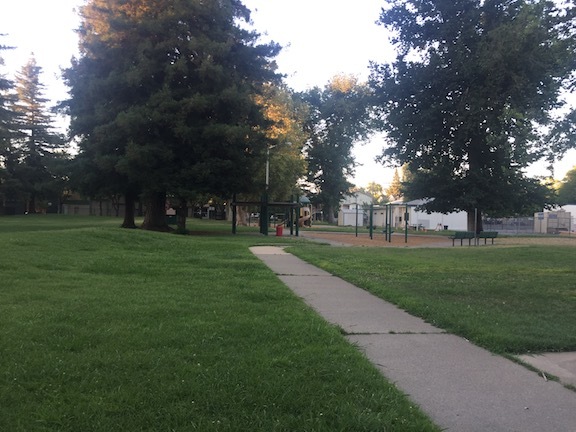 I have been visiting all the parks in Sacramento central city to take photos and see if I can make sense of their characteristics. None of these parks are as dead as Winn, but several are in competition. Before going on to positives in the next post, some comments about what doesn’t work. Crocker Park: It is too shady, no sunlight, nothing to do there. 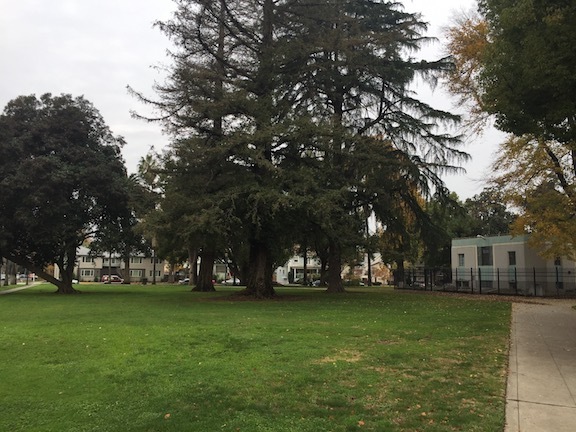 Crocker Art Museum is undertaking a planning process to see how the park can be better integrated into the museum, but for now, no one uses the park. 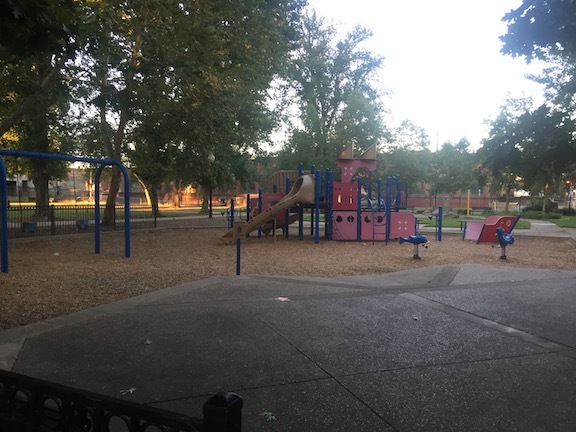 John Muir Children’s Park: This park does not feel safe to me. There is little residential or public presence, eyes on the park. It has an unfriendly fence and poor visibility. I would not take my kids there. 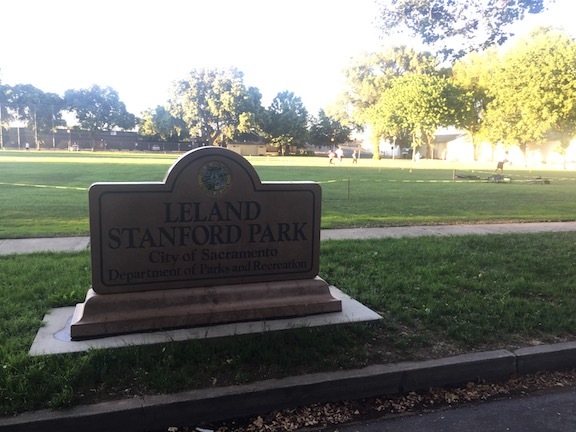 Leland Stanford Park: When a baseball game is on there, the park is used, otherwise it is empty, and a huge waste of water maintaining grass that serves no purpose. Washington Park: This is a school park, and so has restricted access during the school day, as it should, but it seems to be closed all the time, except to people who have the gate code, and I’ve not been able to determine who that is. Saint Rose of Lima Park: Hosts the very popular skating rink in winter, but has nothing to offer the rest of the year. The water play area has been shut down for years. 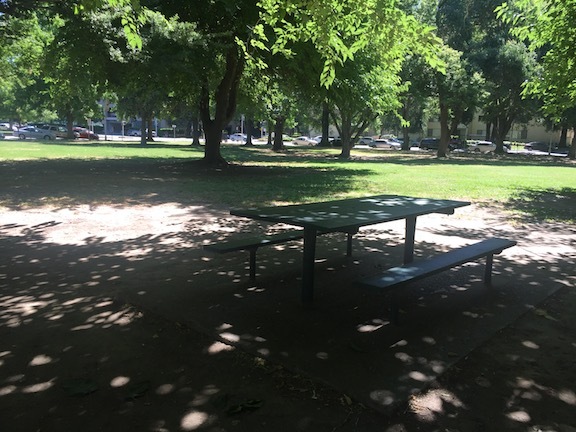 The city’s park directory is available, which you can peruse for amenities.